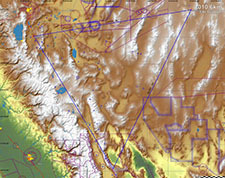 The Minden Standard Courses are a set of 17 pre-defined and well described courses for the use of soaring pilots who fly from Minden-Tahoe Airport. Course distances range from 100 km to 1000 km and meet the FAI prescribed course definitions for triangle, out & return and 3 turn point badge and record attempts. News or Club Event to post? 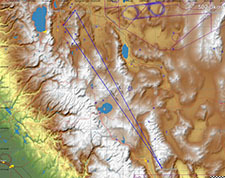 The Minden Standard Courses are a set of 17 pre-defined and well described courses for the use of soaring pilots who fly from Minden-Tahoe Airport. Course distances range from 100 km to 1000 km and meet the FAI prescribed course definitions for triangle, out & return and 3 turn point badge and record attempts. In addition to the basic data needed for flight declarations, other helpful information is provided including course leg and total course distance, a listing of airports along the course, a description of how the course might typically be flown and weather peculiarities and high traffic areas that may be encountered. For both local and visiting pilots, use of these courses can save time and avoid errors in the process of course design and selection of a task suitable for the day’s weather. A less frequent user is the pilot who does, or aspires to, fly competition. Pilots who frequently fly pre-declared tasks will improve their competitive soaring skills more quickly than those who just fly where the weather looks best. This is even more effective practice if they engage one or two other pilots in “match racing” by starting at nearly the same time and altitude and doing good post flight debriefing and analysis to see where the better decisions were made. For these pilots, the day’s task may quickly be selected from the several courses to suit the expected weather … or NOT suit, if they want more of a challenge. The latest major update of the Minden Standard Courses, in 2006, includes the correction of all the calculated distances according to the latest FAI distance formula (available for execution or downloading from: http://www.fai.org/distance_calculation/ ) . The new distances vary only slightly from those from the previous formula, but by enough to force selection of a new Start Point for the 1000 km 3 Turn Point course (a.k.a., the million-meter dash) to achieve the required minimum distance with a landing back at Minden. Also, the true course for each course leg has been added. Finally, a new course has been added … a 100 km triangle, GPS Only course. Similar to previous 100 km record courses, this course was the one used by Marta Najfeld to set a Feminine 15 Meter World Speed Record in three consecutive recent years in July. 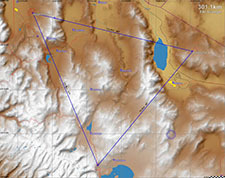 The soaring equivalent to the Olympic 50 meter sprint – a pilot should never be out of gliding distance to Minden – this is a useful course for anyone to practice use of a declared task and to polish their efficient turn point rounding technique. As Marta did, several circuits can be made during a single flight, making for lots of good practice. Right here. Links to each course is listed in the column on the right. So, for badges, records, match racing or for your private “personal best,” go for the Minden Standard Courses.